Is the mouth guard designed for a particular sport being played? Is the age of the athlete and the possibility of providing space for new teeth going to affect the mouth guard? Does the patient have any history of previous dental injury, needing additional protection? Is the mouth guard kind to the jaw joint? 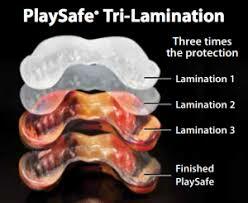 Laboratory-made PlaySafe® sports mouth guards are prescribed for both professional and amateur athletes because they offer the highest level of protection during sports activity. When worn properly, they can prevent dental trauma, such as fractured teeth. PlaySafe® sports mouth guards provide superior fit and retention. Available in six levels of protection, the mouth guards range from one to three layers of laminated ethylvinylacetate material. The best mouth guard is one that has been custom-made for your mouth by your dentist. However, if that isn't an option, you should still wear a stock or a boil-and-bite mouth guard. However, the boil-and-bite, over-the-counter mouth guards can be bulky and difficult for the patient to fit on themselves and are not respectful of the TMJ (jaw joint).